What are the causes of teenage trauma? Medscape says, âRoughly, 15% to 43% of children suffer a traumatic incident. Of these children, 3% to 15% of girls develop PTSD.â Due to a young adultâs significant neural response to traumatic incidents, young adults often develop greater problems than their peers. Their resistance to illness and daily functioning becomes ostensibly lower, and can reach dangerous levels. 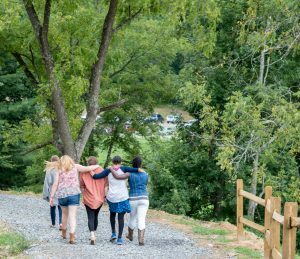 How does Solstice East help teens struggling with Trauma? Young women will benefit from a proper trauma assessment and subsequent natural therapies. Our belief at Solstice East is to transform the entire spirit of an individual. We offer therapeutic methods such as EMDR, neurofeedback, somatic experiencing, Trauma-Focused Equine Psychotherapy, Trauma-Focused Cognitive Behavioral Therapy, and addiction treatment. Treating trauma is a relationship-based effort, and young women have the ability heal because their well-being and care is our entire focus. Solstice East is different than other treatment centers because our program emphasizes the impact adolescent trauma has on the developing mind. Solstice East creates a safe, secure environment for teenage girls. This allows them to follow a path of self healing and reflection. Our program is family-focused and puts an emphasis on keeping in constant contact with our girlsâ families through family therapy sessions, family seminars, multi-family groups, and experiential interventions. At Solstice East, self-sustaining, lifelong change is created through remarkable people and programming. Treatment for a young adult who is suffering from trauma or PTSD must be carefully considered. Because the teenager is experiencing body and mind-altering distress, the treatment approach must be natural, comforting, and be provided in a safe environment. Treatment options start by the teenager focusing on the experience and feeling secure talking about it. 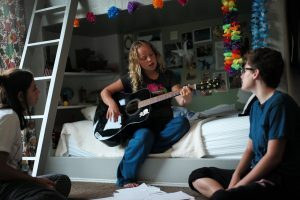 Once the young adult has addressed the traumatic experience and has become stable enough to trust and build relationships, she can move forward to Cognitive Behavioral Therapy and other therapeutic techniques utilized to treat trauma. CBT is a therapist/patient session-based treatment. This treatment is designed to provide the young adult skillful educational tools to learn to process the trauma she has endured. The next line of therapy is a reintegration into the world; animal-based therapy has been proven in helping teenagers regain confidence and develop trusting relationships. Solstice East offers many advanced therapeutic options, and focuses on meeting goals gradually and safely. Another form of therapy utilized to help teens who struggle with traumatic experiences is Eye Movement Desensitization Reprocessing (EMDR). This form of therapy utilizes eye movements to help patients process traumatic memories. At Solstice East, we utilize this form of therapy if a student could benefit from EMDR. Why Should Parents Choose Residential Programming For Trauma in Teens? HELPGUIDE.ORG A collaboration between Harvard Medical School and Helpguide.org helps bring vital information to parents and children of any age. From recognizing the warning signs of mental illness to helping parents see dangerous behaviors in their children, Helpguide.org contains a multitude of easy-to-read pages outlining both the symptoms and the suggested course of action.